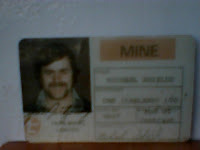 Above left is a picture of a scooptram and right is a photo of me taken in January 1976 when I started work in Tara Mines. My signature is hard to make out. The following story is true. It appears in my book, "Short Trousers Days in Navan" and it was also published in Ireland's Eye in October 2005. Oh no, not again. Another sleepless night. It has been the same for the past fortnight. Ever since that faithful night when Sheriff found himself fighting for his life about half a mile underground. The events of that night came flooding back to haunt him and with such terrible clarity that he realised how lucky he was to be alive. The shift had started the same as any other. He had performed this operation many times before. He was mucking out an open stope by remote control. This operation required him to dismount from his scoop tram and strap the remote control panel around his waist. It was used in areas too dangerous for manual mucking. He would have to stand behind the machine and send it in beyond the brow. When the bucket was full he would guide it back out under the brow, remount and drive off manually to the dump point. He was so used to it he could nearly make the machine talk. The shift had gone well. He had mounted and dismounted at least forty times. It was after lunch and he was looking forward to the end of the shift. It was tough going. He was working in the worse possible situation -upramp. He could see from where he was standing that the bucket was full. Satisfied, he guided the machine out under the brow and switched the power on the remote control panel, which meant that the brakes would be applied. Instead, the scoop tram came hurtling violently towards him. Instinctively he turned and ran, falling to the ground just as the scoop tram caught up with him. Frantically he pressed his right hand against the wheel in a desperate attempt to stop the machine. With his right still pressing the wheel and he squirming to move away and his whole life flashing before him, he thought: " This is it, I'm dead! For a split second, he remembered the rosary beads, which he carried in his breast pocket. Taking his hand from the wheel, he pressed his breast pocket and in the same movement returned his hand to the wheel, crying out: " Jesus mercy, Mary help! " Suddenly the scoop stopped. He could see the body of the scoop tram move down on it's suspension and then rise. He heard the swishing sound from the brakes, then silence. The silence was more terrifying than a scream. His body was shaking uncontrollably. He had soiled himself but wasn't aware of it until much later. His helmet had fallen off his head and lay underneath the scoop tram with it's light shining upwards. From where he lay he could see that the engine was still running. He could see the hydraulic hoses pulsating and oil dripping everywhere, the belly-plate badly scarred from endless hours of hard mucking. He had never seen the machine from this angle before. It terrified him. He tried desperately to get out from underneath the scoop tram but couldn't move because his clothing was caught under the wheel. There he lay for what seemed an eternity, alone and unseen. He was afraid to move or even breath out of fear of reactivating the scoop tram, as the remote control panel was still strapped to his body. Thoughts of dead colleagues who had lost their lives underground invaded his mind. He was deeply troubled. He feared he would never see his wife Josephine, and the children again. There was so much he wanted to say, so much left undone. He was trapped under the wheel for almost an hour. Suddenly he heard the thunderous roar of the muckpile running inside the stope and he felt a slight movement which put the heart crossways in him. A storm began to rage inside his head. His whole life flashed before him again. Grabbing his crescent wrench from it's pouch, which he wore on his right hip and touching his breast pocket once more where he knew his rosary beads were, he said a hurried Act of Contrition. In a mad frenzy like a man possessed, he dug the grit from the base of the wheel. At last he managed to free himself and crawl out from underneath the scoop tram.
" Good God!. What happened? You look like something the cat dragged in ", said Vince. Unable to speak because of the pain in his chest, Sheriff unbuckled the remote control panel and handed it to Vince, gestering to him to turn off the engine of the scoop tram. John helped him on to the back of a scissors-truck and headed for surface. The long painful journey to surface was every bit as traumatic as being trapped underneath the scoop tram. Traveling along the drift they had to endure the full back kick of the Number Seven Ore pass, spewing out it's deadly cloud of dry dust, blinding them as they drove through the Ribcage. Down a steep decline towards the main haulage for the inevitable climb to surface, huddled on the back of the scissors-truck with a relentless icy wind tearing through his fractured, tortured body; the overwhelming smell of blast fumes taking his breath away. Visibility so bad he could hardly see the driver. The constant roar from the engine became horribly amplified the higher they climbed. He became acutely aware of the countless numbers of rockbolts hanging precariously from the back. There was water seeping from the back and sidewalls gushing uncontrollably in places. It was as if the rock itself had come to life and was about to devour him. Bud Ditto's words came back to him. He remembered Bud asking at the interview: " How hungry are you? Only I was so God damned hungry I never would have gone into mining ". Those words took on a whole new meaning as he clung on to the back of the scissors-truck. An overwhelming hunger engulfed him, a type of hunger he had never known before, a hunger to reach the safety of surface. And thanks to Anonymous, but I now know who you are as I met you in town and you revealed yourself, Mick thanks again. Great story Mick and to think that the company are fiddling our pensions. SHAME ON THEM. Thanks Kelly ,Stuart. I survived to tell the tale.